The importance of Dubai regarding any type of business can never be underestimated. Dubai is already hosting large number of businesses from various sectors but the opportunities still haven’t vanished. The government of Dubai is constantly taking new measures to attract investors and professionals of various sectors along with efforts to increase in number of residents and tourists from all over the world. It is the reason that new businesses are not only establishing in Dubai but most of them are also flourishing at good pace. As we know there are opportunities and advantages for establishing any type of business in Dubai. But it becomes several folds if it is related to everyday necessity items like food. There are several reasons to invest in food & beverages industry in UAE. Wealthy population, lare number of tourists and supportive government are few of these. The most profitable business related to food items is restaurant. Growth opportunities for restaurants are available in UAE, especially Dubai. Whether you are a small or big investor, you can expect to grow your business in Dubai by opening restaurant according to size and location of your choice. You can expect to get huge profit from your restaurant business whether it is an inexpensive fast food restaurant, a mid-priced family restaurant or a luxury restaurant for sophisticated population. There are clients for all types of businesses present in Dubai in large numbers. These opportunities are available in Dubai mainland as well as various local free zones. Many free zones in Dubai are specific to a single industry. But it is not a problem for restaurant business. As compared to most of other businesses, there are opportunities for setting up a restaurant in almost all free zones in UAE because of the status of food as a necessity. You can setup small or large restaurant in any of the 25 or so free zones in the emirate. Apart from free zones, lucrative opportunities are also available in Dubai mainland for setting up restaurant. These restaurants can be established in parks, sea shores, outside tourist attractions, industrial and commercial areas, residential areas and other government approved locations. Choosing a location plays important role in success of restaurant business. But you can expect good profit from your restaurant in any area of Dubai. The procedure for setting up your restaurant in any part of Dubai has several requirements. The government of Dubai is extremely serious to provide best quality foods to its citizens and other people that are residing or vising this place. 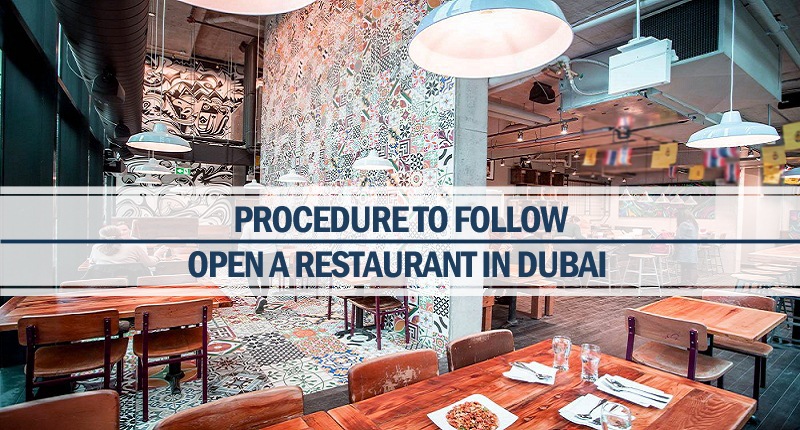 Therefore, there is a food code requirement for restaurants and other food establishments in Dubai. A trade license is required for entrepreneurs before establishing a restaurant here. This license is issued by the Department of Tourism & Commerce Marketing. The activity of restaurant will be mentioned in this license and the owner will only be allowed to serve according to the license type. In the second step, the interested party will take approval from Food Control Department in Dubai for construction of restaurant in allotted area. Different condition and details are clearly mentioned in this approval document. Approval from DED (Department of Economic Development) and other related government departments are also required for opening your restaurant. Different free zones have their own procedure for setting up restaurant that may be similar or different from those that are required in mainland of Dubai. Both these areas demand various documents and other eligibilities for approval of this process. For quick and convenient establishment of restaurant in Dubai mainland or any Dubai-based free zone, you can contact Riz & Mona Consultancy. We will assist you in completing the whole procedure in minimum possible time without any nuisance whether you want to setup your restaurant in mainland of Dubai or any of the several free zones in Dubai.